I'm a little awed by all the changes that happen between five and six. At five, Gareth seemed such a little kid still, fitting in more with the three to four year old interests and behavior and all that. I look at him now, and he seems to have suddenly turned into a big kid, who doesn't seem at all out of place around older nine or ten year olds. Weird. I'm sure some of this has to do with being in school, and of course there are still some little kid behaviors that I hope he'll outgrow in the next few years. Gareth, once again, had spring break the week of his birthday. He still wanted to celebrate with his class, and had requested brownies. So the last day of school before break we brought in some brownies for the class. They do their birthday celebrations at the end of the day, so Malcolm and I headed up to the school a little earlier than usual so we could be there while they sang "Happy Birthday". It was fun to watch Gareth so excited to pass out brownies to his classmates (something I was always sad I never got to do, having a summer birthday). Spring break week was not the greatest for us this year, but Gareth seemed to have a mostly happy day on his birthday. We got his hair trimmed a bit so it's a little more even now. The bangs probably ended up too short because Gareth kept complaining about them in his face. But they'll grow again, and who knows, maybe we'll go back to a longish classic cut in a few months if he keeps complaining about the hair in his face. When we got home from the haircut he helped me put together his favorite meal ever - pasta salad. We'd also purchased some fruit and a loaf of bread to go with dinner. I also took him to Larsen's and let him choose a cookie for each of us, since we wouldn't be having cake that night (elephant for Malcolm, dinosaurs for himself and me, and a meringue cookie for Ryan). During dinner he started complaining of being really cold, so he ate with a blanket on his lap. Even after quite some time under the blanket he was still shivering. And then, after only a second helping of pasta salad (he usually asks for at least three), he leaned back and closed his eyes and I noticed that he really didn't look so great. He had a fever and ended up laying down on the couch to rest while the rest of us finished dinner. He did rally a bit later to eat his cookie, but went to bed shortly after that. Thankfully Gareth got over his illness pretty quickly. He's still coughing (this is nothing new; he's been coughing since he got a cold at the beginning of March), but the fever was gone by the next morning. I got to work Thursday evening on his cake, staying up late to bake it. I stayed up late Friday night to frost it, and Gareth helped me finish the final touches Saturday morning. 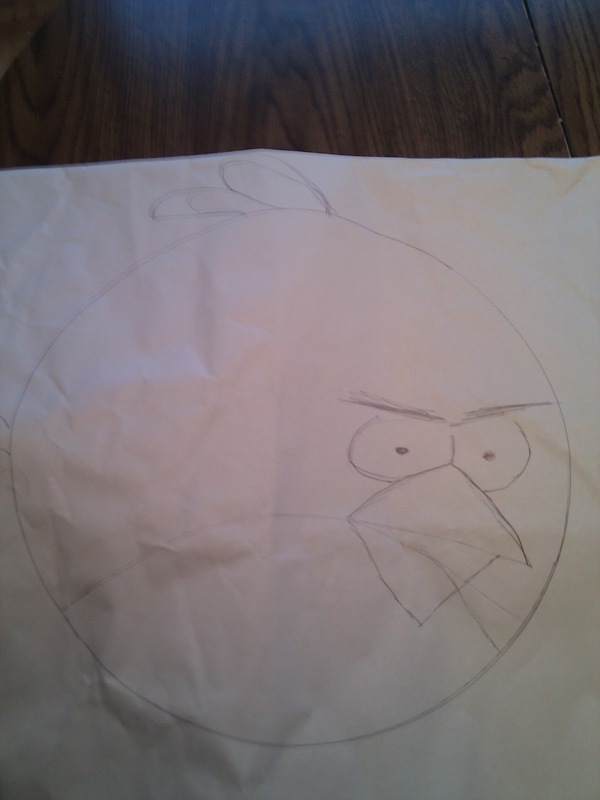 I was really worried that he was going to want something that I just couldn't do, but I lucked out this year when he hit upon the idea of Angry Birds. I was about to laugh and say that might be a bit difficult and then I thought about it for a second and realized that it'd be perfect because the artwork in that game is actually very simplistic. 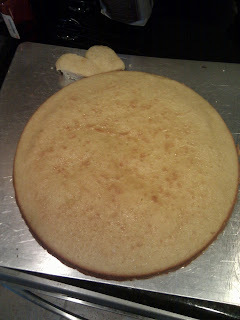 I ordered a 12-inch round cake pan from Amazon, large enough to fit the same amount of batter as a 9x13 at least. A few years ago my mom and I made a cake at Easter, the cake part of which was one of the most delicious we'd ever tasted. I decided I'd use that recipe, which would leave enough batter to make a few cupcakes as well. The eyebrows were easy to figure out - licorice. And, after a few other suggestions, my mom came up with the brilliant idea to use those candy melt things for the beak. I was worried when I bought them that they'd be too runny when they melted, but they worked perfectly. 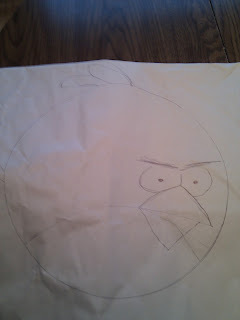 Before baking the cake, I traced the pan on some paper so I could make a rough sketch to help me with the decorating. 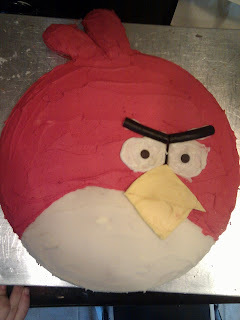 And here you can see the beak, before it was added to the cake. I melted the candy melts in the microwave, spread some of the melted stuff in a circle on some parchment paper and then cut out the shape once it was almost hardened again. Here's the cake as it was late Friday night. I used a recipe from the back of the cocoa powder tin for the buttercream frosting. I used it as a guide when I made the chocolate frosting for the brownies and realized that it used about half as much powdered sugar as the recipe I usually use does, which makes for a delicious but much less sweet frosting. I did a thin crumb coat to connect the tufts and keep crumbs from the sides in place. 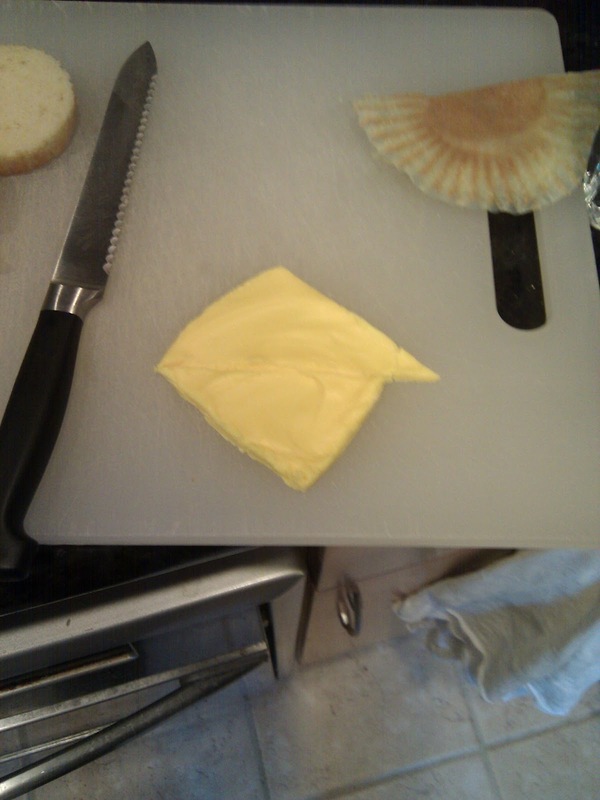 Let that dry for a bit then spread on the plain frosting. Then I used some of the paste food coloring to color my remaining frosting red. Then pressed on the beak while those were still wet and left it to dry overnight. Saturday morning Gareth helped me whip up a smaller batch of frosting so we could finish the cake. I cut a piece of round licorice in half for the eyebrows and used a couple of chocolate chips turned upside down for the center of the eyes. The kids who came to the party all seemed sufficiently impressed/excited about it. What really mattered was how excited Gareth was about it, which was extremely. We had six kids over for the party, which is really pushing it for me. Malcolm thankfully slept through the whole thing. We pulled out the marble run and the legos and had some snacks out for them to munch on. Most of the kids participated in a rousing game of duck-duck-goose and several of them spent a good chunk of the play time wrestling one another. They all spent a lot of time shouting (I had a headache for a couple hours after it was all over, though that was probably partly due to my lack of sleep that week). Gareth received some pretty awesome gifts, all of which he's been having a ton of fun playing with ever since. We sent all of the kids home with a small goodie bag and a red or green balloon (we ended up with just enough - started out with twelve, but they were popping like crazy). Gareth was very happy with how his birthday celebration turned out, saying it was super-awesome, double good or something to that effect. I actually do have some pictures of him, and not just the cake, but they're all on the camera, so they'll have to get uploaded another day. Overall, it turned out to be a lot less work and stress than I'd anticipated to put this together this year. And how happy it made Gareth definitely made it worth it. 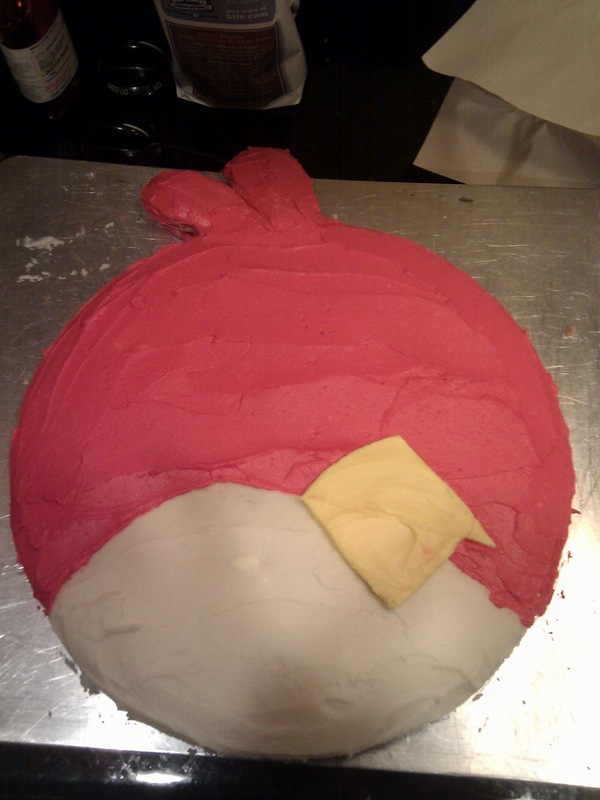 I can't get over how awesome that cake is. Wow.